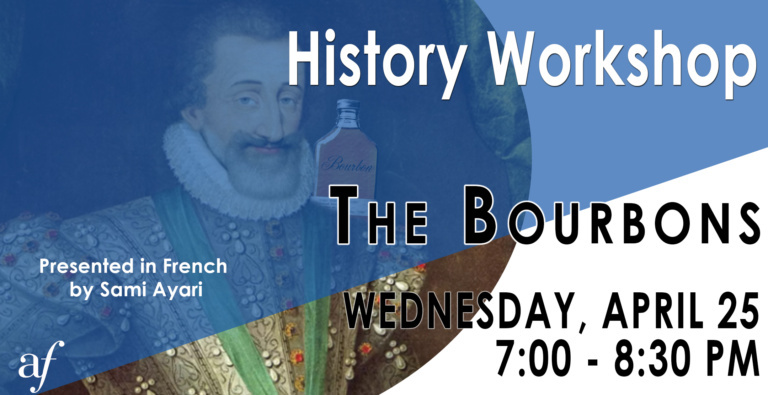 On Wednesday April 25 at 7pm, join us for a new History Workshop about the Bourbon dynasty! This workshop will chart the rise, fall and rise again of the Bourbon dynasty that ruled France from 1589 to 1830. Louis XIV’s panache and Louis XVI’s tragic execution are generally known by all , so is the fact that a Bourbon holds the throne of nowadays’s Spain. Bourbon County, Kentucky, was named in 1786 after the French house of Bourbon in gratitude for Louis XVI of France’s assistance during the American Revolutionary War. $20 for Members – $35 for non-members.